← Crizotinib (Xalkori) approved for ROS1-positive NSCLC! Dr. D Ross Camidge, MD, PhD, at the University of Colorado (CU) Cancer Center has provided me and many other lung cancer patients and caregivers with hope, support, effective clinical trials, remote second opinions and excellent cancer care. On April 5, Dr. Camidge’s work will be honored as he formally accepts the newly-created Joyce Zeff Endowed Chair in Lung Cancer Research. A patient speaker (not me) will be talking at the event about Dr. Camidge’s impact on patients. We have a unique opportunity to show Dr Camidge–as well as the donor Ms. Zeff and CU–how many people he has helped in lung cancer patient communities . If you are willing to have your Camidge experiences and kudos shared from the stage at the recognition ceremony, please post them below. I’ll make sure they get to the patient who will be speaking. If you want your name (real or online) associated with the quote, please say so in your post. 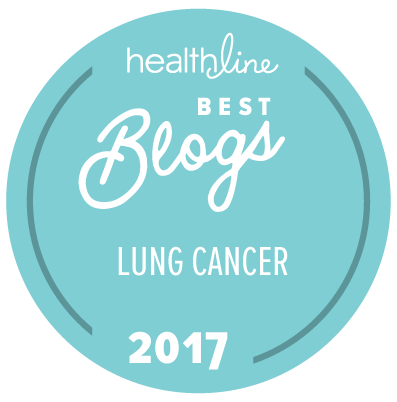 This entry was posted in Advocacy, Clinical Trial, Lung Cancer, Patient Advocacy, Precision Medicine, Research, The Bright Side. Bookmark the permalink. Thank you for this announcement. It’s so nice to hear that my Onc’s Onc will be honored for the endowment. I congratulated him on this a few months ago, but yes, I’d love to write something for the patient speaker to read. Your advocacy in the fight against cancer is awesome. It is true I have never met Dr. Camidge in person, nor spoken with him on a phone consult. My relationship is simply as an ALK positive patient, trying to learn more about my stage 4 lung cancer and prognosis. I have never travelled to University of Colorado; instead Dr. Camidge visits me at my home. My connection to Dr. Camidge is via my computer (albeit one-way) and has helped me a great deal in learning the current thinking of how physicians are treating this disease. As an ALK positive patient with brain metastasis, I listened intently to his “Weeding the Garden” speech when I was newly diagnosed. When he talked about brain metastasis leading to poor prognosis, I felt like he was speaking directly to me. We are so lucky to live at a time that we can watch and download discussions of one of the leading ALK NSCLC experts via the Internet, and we are fortunate that he freely disseminates his cutting edge knowledge. And despite the sometimes technical nature of the discussions, he can keep the audience focused and even chuckling (from time to time). The other connection I have with Dr. Camidge is that he is the principal researcher for the clinical trial medicine (Brigatinib) I’ve been taking for more than two years. I’m very pleased that this clinical trial has lived up to the promise of delivering tomorrow’s medicine to today’s patients. Dr. Camidge, thank you for so much!